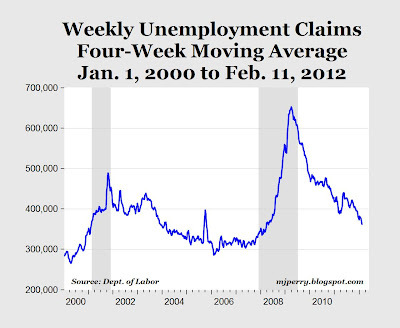 In another positive sign that the U.S. labor market is gradually improving, the Labor Department reported today that the four-week moving average for initial jobless claims fell to 362,250 for the week ending February 11, which is the lowest level since the week of April 26, 2008, almost four years ago (see chart above). This marks the fifth consecutive weekly decline in the four-week moving average, and the tenth decline in the last eleven weeks. The number of seasonally-adjusted initial claims (not the four-week average) fell to 348,000, the lowest level since early March 2008. If the current rate of decline in jobless claims over the last few months continues (-3,100 average per week since December), the four-week moving average for initial jobless claims will be back to pre-recession, November 2007 levels by mid April. Mark is an unabashed optimist and reports half the story. 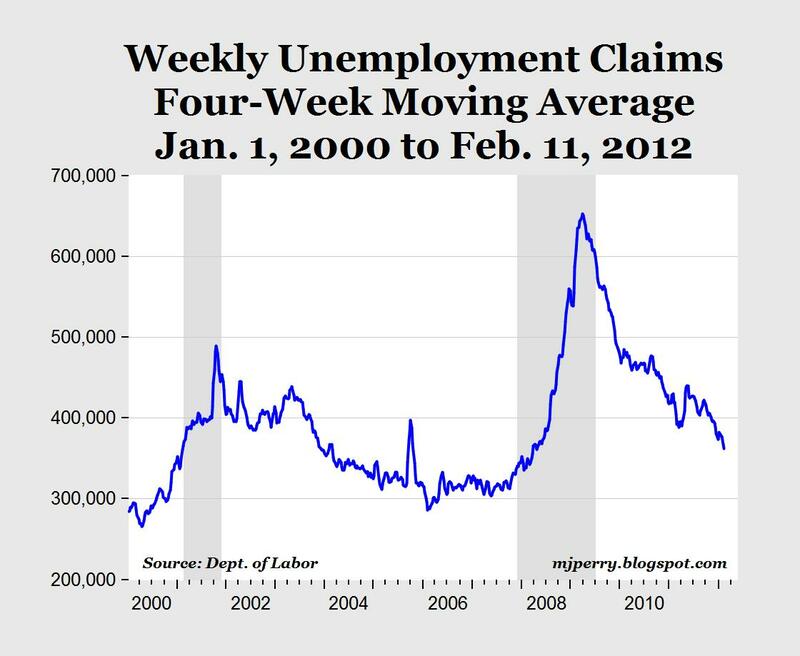 Jobless claims are falling because people can;t get work and can't apply again. What we need to look at is the number of people working, and it is no where near prerecession levels. We just lost 2.7 million jobs in January unadjusted or as Mark reports gained 243,000 adjusted. Man, you people are more depressing than a room full of Democrats at the RNC. The private sector has added 2 million jobs over the past year (not seasonally adjusted) and that's including January's job loss (which, by the way, was much much milder than usual) and all you do is piss and moan about how bad things are. You, my friends, have been taken in by the media trying to turn an economic expansion into a recession to sell more newspapers. You spend all your time looking at one month and trying to extrapolate trends from that. It's a fool's errand and you will always see what you want to see. According to what credible source? While we can explain that is due both government and business being against US citizens.